This edition of 1775 is dedicated to Army G1 Operations. In June of 2001, I PCS’d from the War College to the Department of the Army, Deputy Chief of Staff, Personnel (or Army G1) and was assigned as the Chief, Enlisted Personnel Policy Branch for the Army. LTG Timothy J. Maude, who I had not had a previous opportunity to work for, was the Army G1 upon my arrival at The Pentagon. Little did I realize how dramatic the Army and the nation would change in three short months with the tragic events that occurred on September 11, 2001. We lost LTG Maude, SGM Strickland and many other AG heroes killed in action on 9-11. I was so fortunate to have moved away from the E Ring toward the C Ring of The Pentagon that morning when American Airlines Flight 77, commandeered by al-Qaeda terrorist, crashed into the west side of The Pentagon killing many. The crash created a partial collapse of The Pentagon’s western side and directly contributed to the many casualties within the Army G1. Resolute and determined, the survivors of the Army G1 immediately regrouped at Human Resources Command, at that time relocated in the Hoffman complex located in Alexandria, VA. I was very proud to have been a part of an Army G1 effort that continued HR operations in light of the horrific events of 9-11. I was even prouder to return to The Pentagon as part of the team to replant the Army G1 guidon after repairs to the building were completed following the terrorist attack. Upon our return to The Pentagon, I can recall asking the new Army G1, LTG John M. LeMoyne, if I could PCS to a Corps G1 billet to better support the new global war on terrorism. LTG LeMoyne told me I still needed to learn “The Building” (a.k.a., The Pentagon). Being a bit of a wise-apple, I told him I already knew where my Pentagon cubicle was, and where the food court and latrines were. Without blinking, he told me, “you know what I mean.” And he was right. I needed more time to truly appreciate and learn how the Army G1 supports the Army’s HR mission from the enterprise level and the linkages required within the rest of DA to do so. The follow on lessons I learned were invaluable in later being able to balance and represent my Corps Commander’s priorities with the rest of the Army. As much as we AGs want to think our Commander’s requirements are always the priority, sometimes Army priorities take precedence until your command is once again in the que to deploy. 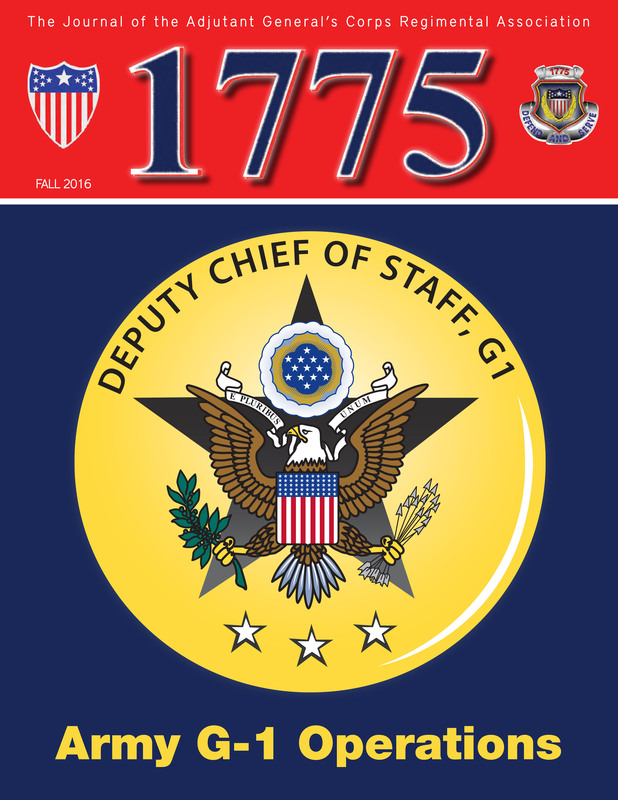 We hope you enjoy this edition of 1775 and our articles from the Army G1 Directorate explaining how they provide HR support at the enterprise level. We welcome your feedback by e-mailing comments to magazine@agcra.com.